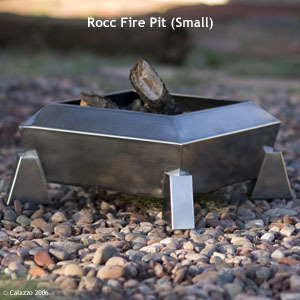 The Rocc Fire Pit is designed with simple contemporary lines that mirror the form of a rocket. Hand made from stainless steel, it is carefully formed into a one piece structure that is sculptural in quality. When lit at night, the stainless steel structure helps radiate the warmth of the fire as well as reflecting the glow of the fire. Removable stainless steel log and charcoal grill holder enhances air flow and heat output.